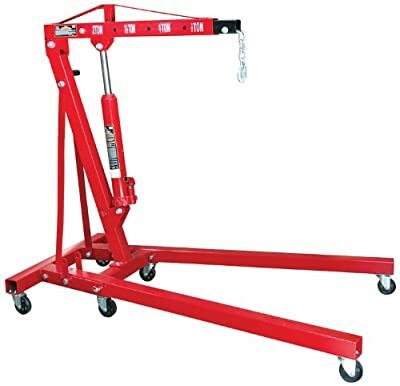 An engine hoist is one of the must-haves in a complete car care facility. If you work as a mechanic, or if you love cars and you want to have a useful repair tool in the garage, this is one thing that you need to have. 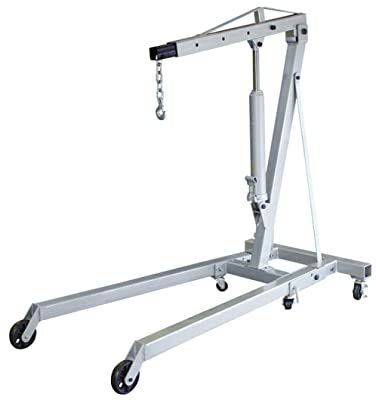 The best engine hoist will make your life easier in more ways than one, specifically when it comes to lifting objects in cramped spaces. While the market is filled with options for a top-rated engine hoist, there should be no excuse for you to be reckless when making decisions. If you need help in coming up with the right decision, keep on reading and learn from the valuable insights that I will be sharing below. Do not look far if you want to have a reliable engine hoist. Keep an eye on the five products that will be briefly mentioned below. If the garage or the repair facility is small, there is no need to worry. The compact body of the hoist is perhaps one of its best assets, making it excellent when it comes to space-efficiency. Even with limited floor space, you will be able to use the crane. It is also a good thing that it comes with a foldable design, which will make it easy to store when not used. This model has a stated capacity of 4,000 pounds. This will be more than enough for most cars. 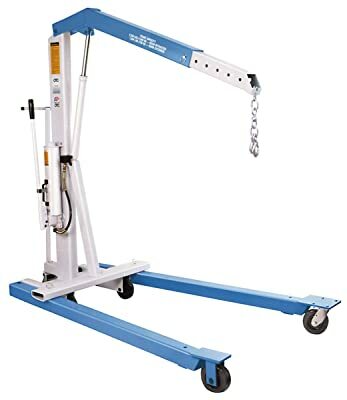 On the other hand, if you intend to repair trucks or other vehicles with bigger engines, you might want to look for a hoist that can support a higher weight. Portability is another asset of this product. Aside from being foldable, it is also a good thing that it comes with wheels. The front wheels are 3-1/2 inches. Meanwhile, the rear wheels are 5-7/8 inches. In terms of reach, you can have it customized from 25 to 46 inches, which makes it versatile enough to tackle a variety of hoisting applications. Torin is a company with decades of experience in the global market, which can already provide you with the confidence that this product will deliver superior performance. Its maximum weight capacity is 2,000 pounds. Meanwhile, the lifting range is from 1 to 78.75 inches. It is equipped with six wheels, which will be excellent in terms of mobility. It will be easy to have it moved around depending on where you intend to work. The wheels can also be locked to secure its position when you are ready to work, which is important for your safety. The hydraulic jack that comes with the engine hoist is also exceptional, especially because it is able to support loads of up to 8 tons. Meanwhile, with the pin locking mechanism, it will be easy for you to secure the system when it is lifting an engine. Lastly, this engine hoist from Torin is made of a sturdy frame that can resist common external elements. As long as you clean it regularly and follow the weight capacity that the manufacturer states, this is one product that can last for a long time. With a maximum capacity of 6,000 pounds, this will be able to lift even heavier engines without showing any sign of difficulty. It also has a tough steel construction, which will prevent it from deforming or bending as long as you follow the stated capacity. The adjustable boom position is also a plus. You can have it customized in four positions depending on what is required for a specific task. It also comes with a high-performing hydraulic jack, which is one of the reasons why its hoisting capability will be hard to match. It might be quite expensive, but it will be worth every dollar given how superior it is compared to many of its competitors. There are two extendable legs, which will allow you to have them positioned as needed. For the wheels, on the other hand, there are only four. It would have been better if there are six wheels, especially because of its high capacity. Having more wheels would make it more stable. This is from the same manufacturer as the product that has been mentioned above. One of the biggest differences between the two, however, is the fact that the lifting capacity is smaller, which is only two pounds. It also has six wheels, while the other one has four wheels. As a top-rated option in the market for engine hoists, one of the most notable features is the extendable boom, which you can change in four positions depending on the weight that will be hoisted. It also comes with a 12-inch forged steel chain, which is hard to match in terms of the durability that it can offer. You can be confident that it will not break unexpectedly, provided that you follow the weight capacity that the manufacturer states. The engine hoist can also be folded, which will significantly reduce its size when it is not used. This is a good thing when it comes to space-efficiency, especially when the garage is small. Lastly, the manufacturer is offering a one-year warranty against defects, which is pretty much the standard within the product category. 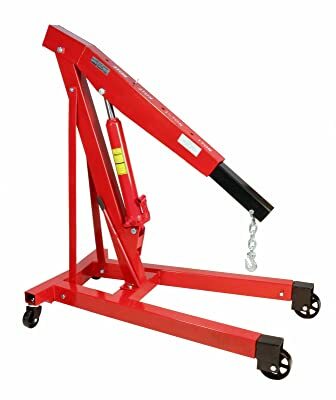 Wrapping up our list is another crane that will work well only for small engines since the maximum weight capacity is only 4,400 pounds. The engine will be attached to an 18-3/8-inch lifting chain, which is made using premium materials to make sure that it will not accidentally break. Similar to the four products that have been mentioned above, this will not also be a disappointment when it comes to versatility, basically because of the options for customization that are available. There is a telescoping boom, which will allow you to expand your reach. The leg can also be adjusted as desired. One more thing that you are guaranteed to love in this engine hoist is the two-speed hydraulic pump that can be operated by hand. Although it is pumped manually, you will be able to do this in a snap. There are also smooth-rolling casters that are excellent when it comes to mobility. When the wheels are locked, it will stay in its place to allow you to work safely. 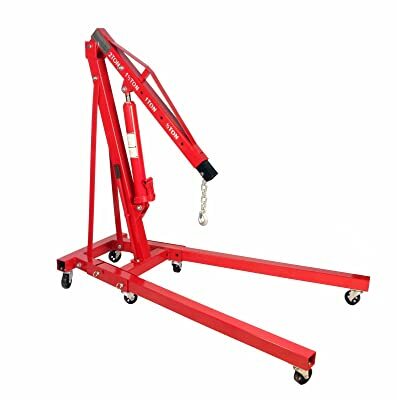 Hydraulic Engine Hoist: This makes use of a hydraulic cylinder to be able to move the engine. This is the most popular of the three types that are available. The hydraulic jack is the one that is responsible for doing the work. It is easy to operate and assemble, which is why it is popular with beginners. Chain Engine Hoist: As the name implies, there is a chain at which the engine is attached when it is removed from the hood. It is operated manually, so take note that it will require physical effort on your end. It is slower than the two types and is also quite limited in terms of the maximum weight capacity that it can support, which is usually only up to 6 tons. Electric Engine Hoist: It is almost the same as the chain engine hoist. The most significant difference is that it does not rely on manual effort to remove the engine. It is a common choice for industrial applications because of its powerful performance. Capacity: One of the most important things you have to consider is the maximum weight that the hoist can support. For most small engines, 4,000 pounds will be more than enough. Be sure to follow the recommended capacity by the manufacturer to be able to work safely. Ease of Use: From the assembly to the operation of the hoist, make sure that it is going to be user-friendly. The manufacturer must also provide comprehensive instructions on how to use the hoist, especially with regards to safety precautions. Mobility: It will also be good if the hoist comes with wheels, which means that you can move it around with ease. The wheels should have locks to keep it in a stable position when you are already working. Size: The first thing that you have to do is to look at the size of the garage where the hoist will be placed to determine the right dimensions of the hoist that could fit. You will benefit from one that is foldable, especially of the space is limited. Versatility: To be versatile, one of the most important would be an adjustable boom, which should be customizable depending on a specific application. With the multiple positions of the boom, it will be more versatile. Make your garage complete with the best garage hoist on the market, including the five products that we have reviewed briefly in this post. They will be useful when lifting engines to perform an inspection and repair, as well as when you have to put it back.